Contact lenses are thin concave lens which are placed directly on the eye surface for providing correct eye vision. It is basically recommended as the medical equipment for worn out eyes defects and sometimes used for cosmetic purpose also. Million people use it worldwide to avoid the use of spectacles Overall people of average age of 31 years wear it and most of the users include female consumers. Contact lenses are most preferable for athletes or person who has many outdoor activities. First is the cosmetic factor. Wearing lens helps in avoiding the use of glasses and gives you a natural look without obscuring your face. Second is the functional factor. These lenses provide far more advantages than wearing of specs especially in the case of perspiration reason. Third is the cure factor. It can cure many eye defects which are very helpful in removing the eye defect in some cases. 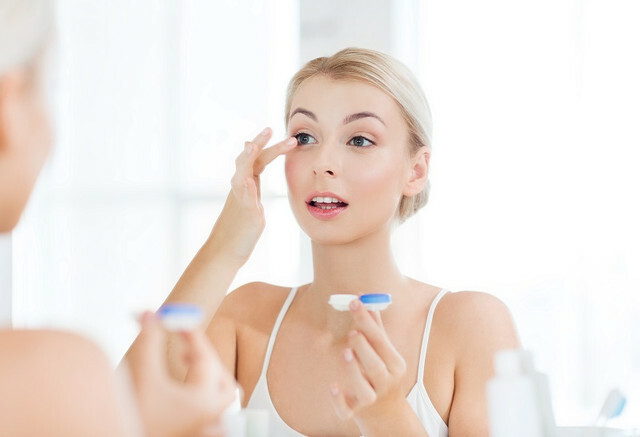 Although wearing glasses are more beneficial but when it comes to fashion and style, contact lenses has always been in the top list of the cosmetics used. Used to change the appearance of the eye for an attractive look. Used to correct the refractive error of eye. Many companies provide color tinted lenses which are easier to use which changes the color of eye iris. These lenses fully cover up the iris and some are made as the size of the iris for perfect fitting and for highlighting the iris color. These lenses are only provided only under a doctor’s prescription. These fit perfectly in the eye without causing any irritation or redness. These kinds of lenses are available everywhere but basically found in Japan, China and South Korea. It forms the exact shape of the curvature of eye. Causes less vision distortions and allows wider viewing. Causes fewer obstructions than eyeglasses. It does not clash while wearing clothes or if by chance cloth piece enter inside the eye. They are not damage in case of terrible weather conditions and do not fog up in winters as the eyeglasses. It reshapes the cornea without any difficulty. It is easy to wear and easy to remove and does not cause any internal eye infections. It protects our eyes from ultra violet rays, especially when sunglasses cannot be worn. Using of lens in correct and proper ways are beneficial to eye. Usage of lens has made lives of many people easier and especially women. It gives you freedom to be active with a sharp, direct and clearer vision. All the insults or traumas of wearing sunglasses will be overcome with wearing of these contact lens.